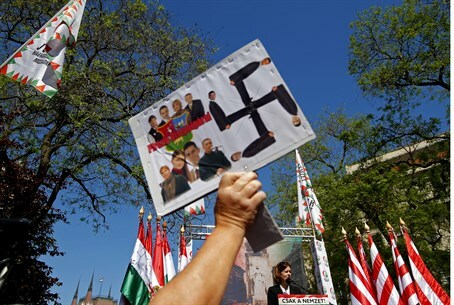 Far-right Jobbik party had fronted campaign to name part of Gyomro's town square after Nazi-Allied leader; Mayor issues apology. A Hungarian town has voted to scrap its decision to name a square after Miklos Horthy, Hungary's Nazi-allied wartime leader, a controversial move the town's leaders said Tuesday was a "mistake". Part of a main square in Gyomro, a town of 15,000 on the outskirts of Budapest, was named Horthy Park in 2012 following a motion by the local councilor of Hungary's far-right Jobbik party. "That was a mistake, I apologize to anyone hurt by it," Gyomro's mayor Levente Gyenes told Hungarian news agency MTI after the council voted to rename the space "Main Square" from June 1. The 2012 decision which sparked protests by locals who forced an unsuccessful referendum on the issue had also "painted Gyomro in a negative light," vice-mayor Attila Mezey admitted to MTI. "The judgement of Horthy is a matter for historians, not a municipality," he added. Horthy was an autocrat who ruled from 1920 to 1944 when Nazi Germany invaded Hungary and ousted him from power. He had previously brought Hungary into an uneasy alliance with Hitler, passed anti-Jewish laws and was in charge when Hungarian Jews began being deported to death camps. But the late leader is revered by far-right groups and some public figures as a hero for opposing a short-lived communist revolution in 1919 and restoring some of the territory lost at the 1920 Trianon Peace Treaty.